I am so excited to bring to you this review of Jillibean Soup's "Coconut Lime Soup"! Jillibean Soup is a scrapbook paper and embellishment company started by Jill Yegerlehner, a scrapper her self! 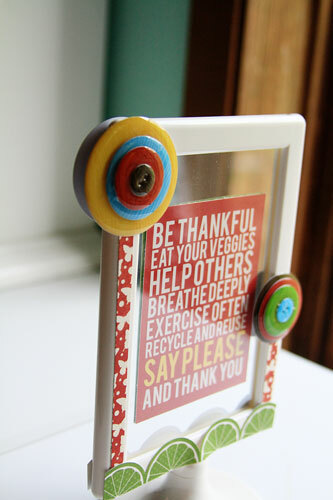 Jillibean Soup offers fresh, fun, and sweet papers, stickers, alphas, die cuts, made of 100% recycled stock! The colors and graphics are so happy and whimsical and just perfect for any project. Jillibean does have a blog that keeps you updated on sales, new lines, and gorgeous works from their design team! You can also follow them on Facebook and Pinterest! Ease of use: Well this is a no-brainer! I LOVE the colors and patterns and graphics of this line. Everything is color coordinated so you really can not go wrong. I love the sturdiness of the paper. Really cute alpha stickers to got with the line and love the 6x6 mini pads of paper! Great for card making! Construction/Durability: I appreciate nice heavy stock paper that is still easy to use and manipulate and Jillibean Soup offers this. I had no problem tearing or wrapping the paper on my projects! Usefulness: Well let me just tell you I found several different ways to use this line and thought of many more. 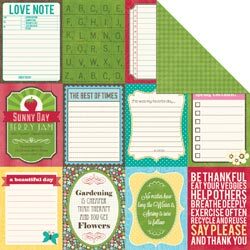 It kind of had a garden, homegrown, spring theme but it would be so easy to expand the papers and stickers to so many other themes! I like that in a product! You get more mileage for your money! Cost effectiveness: Quite comparable to other products available out there that have similar characteristics. What I liked: The sturdiness of the paper, the colors and patterns (so cute), and I always love that they put patterns and colors together for you and you can just play and create! I love that! What I didn't like: Well.....nothing to be quite honest! A double sided photo frame! Jillibean Soup "Coconut Lime Soup" products, Ikea double sided frame. Product: Jillibean Soup "Coconut Lime Soup"
What do you think? Have you created with Jillibean Soup products? What do you think of their new lines? Leave a comment by midnight EST on Tuesday to be entered to win a prize pack from Jillibean Soup! U.S. residents only and leave your email address so we can contact you if you win! 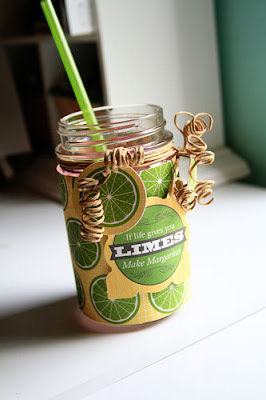 OK, that little drink wrap that you made is just too perfect and too cute! Looks like you had a lot of fun with this line. Thanks for the chance to win! I have always like the JB Soup lines... love the kraft colors! This is such a great line! I love Jillibean Soup, especially the bright-colored lines! I also love their Card Kitchen kits, which come full of coordinating goodies. I love this line and love what you made! Great projects. I have enjoyed Jillibean products for some time now. They are so graphically adorable. I love JilliiBean Soup. I buy there products all the time. I really love how all the different collections can be used together . The colors are so beautiful . I bought one of their Card Kits and it is awesome . Thanks for a chance to win. I always love Jillibean Soup but this line has me on the fence. I totally think it's great but have been trying to think of projects until I saw this post. It's totally made me rethink and it would be great to win a prize pack! Love these projects!!! I love Jillibean, the colors are always so vibrant! GREAT projects! I love what you created! I love, love the JB soup labels- can never have enough of those. And I am really enjoying my 6x6 pads! These are really cute! I like how they have brought in some brighter colors! Love that frame. I have been drooling ever since I saw this line appear. I love the colors and jillibean always has the perfect embellies to go with. Super cute projects! I love JB Soup! It is a beautiful collection. The projects are great. Thanks for the chance. I love JBS, and love these papers. The fruit is especially cute. The gingham is great. It goes really well with the other papers. They make cute papers, stamps, and other things that all go together well. This line is really nice for spring and summer. The colors and papers look very high quality. WOW, I LOVE this collection! The colors are fabulous and the papers are just yummy! Especially like the journaling cards! Always love Jillibean Soup! Great projects. Thanks for the chance! Oh - CUTE!!! This line just looks darling! LOVE all the little sayings and touches!!! This is an adorable line! I love the "jar" theme, the colors, and I think I need a full-size version of that family rules journal card that you used for your frame. TFS this cool line, and thanks for the chance to win! The strawberries paper and jar stamps are really cute. I think that I would use these a lot, for many different purposes. I'm going to learn to make jam, so it would be perfect for me. I like that you said that the paper is nice and thick. Jillibean paper lines are some of my favorite to scrap with and I am very excited for the new lines to be released! I ususally hate coconut, but this I like! I haven't seen this line before so I am definitely interested in what else is available. Thanks for the review. Love the double sided frame! These colors are fantastic! I love Jillibean Soup - their new alpha stickers and soup labels are great. Their Sweet and Soup line was one of my favorites ever - I've hoarded a few of the papers because I know I'll want to use them a lot, such fun colors and patterns. I love Jillibean Soup products! 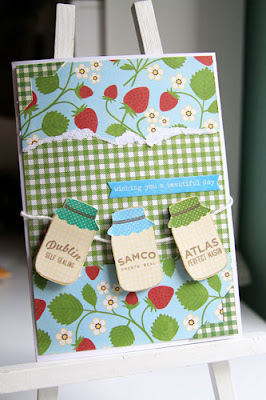 I have used some of their paper & soup labels & would love more to add to my collection. Thanks for the chance to win! Love your projects and JBS. Would love to win some. I have loved Jillibean Soup products for years. i would love this line or any items from Jillibean ... love! Really cute projects. Love Jillibean Soup lately. They have some very fun versatile products. Fantastic projects! Jillibean Soup is just awesome and they are quickly becoming one of my favorite lines! I especially love the sheet of paper with all the little cards that can be cut out! Thanks so much for the review! I love this new collection from Jillibean, the colors are so bright and so very fun! I just purchased their spring line and I'm set to make some easter cards this weekend. I adore your creations! I love Jillibean Soup!! I think these new releases are the best yet from them. 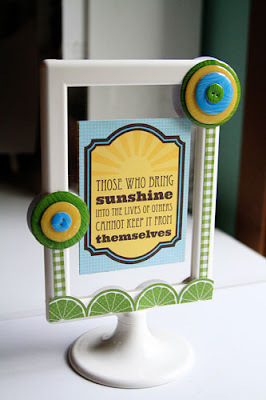 Love your double sided frame! !